The National Film and Television School (NFTS) is proud to announce it is the first ever film school to win a Queen’s Anniversary Prize for Higher and Further Education. The NFTS is among twenty-one universities and colleges of further education who were announced as recipients of Queen’s Anniversary Prizes in the current - twelfth biennial - round of the scheme at an event hosted at St James’s Palace by The Royal Anniversary Trust today. The Prizes are part of the honours system and are awarded every two years by The Queen on the Prime Minister’s advice. Work recognised in this round is wide ranging and includes rail and aviation engineering, costume design, vision problems of children with Down’s syndrome, parent-infant sleep, climate change and environmental protection, women’s health, the English language, agricultural engineering and dairy productivity, cancer drug discovery and drug safety, film and television training, photonics, food and nutrition for health and education for learners with special needs. 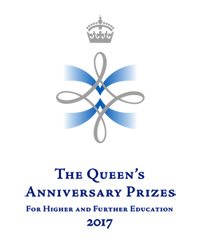 The Prizes, unique in the honours system in being analogous to honours to individuals but granted to an institution as a whole (irrespective of the area of work recognised), will be presented in February 2018 by a member of the royal family at a ceremony to be held at Buckingham Palace. As a national honour the prize carries no cash value, consisting of a silver-gilt medallion and a Prize Certificate signed by HM The Queen.